Like Nesbit's Railway Children, the story begins when a group of children move from London to the countryside of Kent. While playing in a gravel pit soon after the move, they uncover a rather grumpy, ugly and occasionally malevolent sand-fairy known as the Psammead who is compelled to grant one wish of theirs per day. 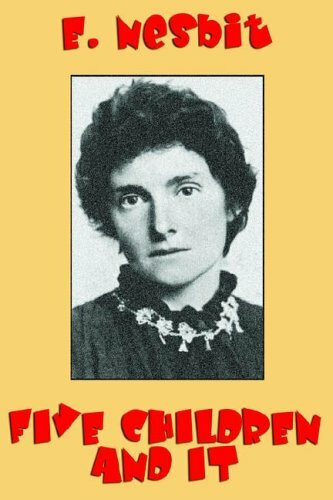 Edith Nesbit (1858-1924) was a prolific children's author, publishing more than forty novels or collections of stories. Collaborating with others, Nesbit published about as many more. Her children's books are known for being entertaining without turning didactic, although some of her earlier works, notably Five Children and It veered in this direction. According to her biographer Julia Briggs, Nesbit was "the first modern writer for children" and "helped to reverse the great tradition of children's literature inaugurated by Carroll, MacDonald and Kenneth Grahame, in turning away from their secondary worlds to the tough truths to be won from encounters with things-as-they-are, previously the province of adult novels." Briggs also credits Nesbit with inventing the children's adventure story. Among Nesbit's best-known books are The Story of the Treasure Seekers (1898) and The Wouldbegoods (1899), which both recount stories about the Bastables, a fictional family that Nesbit likely styled upon her own childhood family. Nesbit's children's writing also included numerous plays and collections of verse. 8/29/2008 Donald Jeffries said: E. Nesbit inspired both Edward Eager and J.K. Rowling, so you know she must have been pretty good. Her books are still fresh, some 100 years after they were written.